Fluendo and Glasgow Girls FC in the Scottish Football Association, struck a new multimedia video technology deal aimed to upgrade club training methods and technical awareness though the use of sport analytics. The GGFC Community Quality Mark club signed up for LongoMatch video analysis software to benefit over 200 registered youth girls in the Scottish Women’s Football League. LongoMatch and the GGFC located in the East-End of Glasgow, an area very near where my son’s Mothers-side of the family was living before relocating to Ellis Island, NY years ago. So it gives me great honor to share this Fluendo and LongoMatch sports tech news with the Sports Techie community blog and the soccer stats loving folks of Scotland. 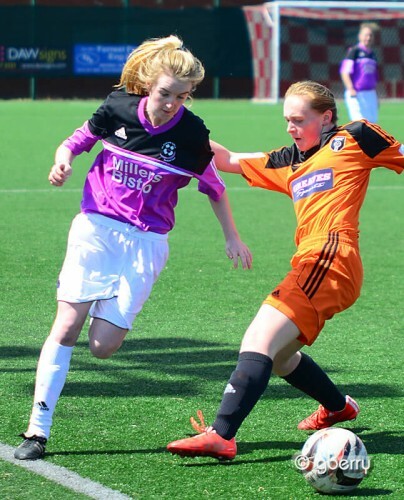 Fluendo’s LongoMatch Expands into Scotland with Glasgow Girls Football Club. Fluendo continues with their global soccer business development strategy by entering Scotland for the first time with a new partnership together with the Glasgow Girls FC. GGFC began SWFL play in 2008 with one coach and 12 girls and has grown to three different departments in order to offer football to different age and ability. Age ranges include u7, u9, u11, u13, u15, u17, u20 and senior level teams under the supervision of Club Chairperson Jim Strathdee. Home matches are played at Budhill Park. “Our new partnership with Glasgow Girls FC is a first in Scotland. We are delighted to team up with this organization and their unique vision. We look forward to seeing the benefits LongoMatch brings to GGFC,” said David Mascioni, Fluendo marketing manager. Fluendo Signs Video Analytics Deal With Glasgow Girls Football Club in Scotland – SportsTechie blog. Professional and amateur teams around the world including the Belgium national World Cup soccer team, the Spanish Padel Federation, the Royal Spanish Handball Federation, STB Le Havre Basketball team French Division A, and the Harvard University women’s soccer team are all using LongoMatch’s sports analytics product. With LongoMatch software, it is easy for users to record and edit videos with tags and diagrams to produce robust game statistics and key performance breakdowns. The sports tech solution can be customized for any sport. Fluendo technologies offer unique compatible with all software platforms. LongoMatch provides coaches, parents and players the ability to review tagged events in-game and also export video clips while continuing to analyze live games. LongoMatch is an award-winning cross-platform software tool that lets users perform real-time analysis on sports video feeds. LongoMatch is customizable to any sport and compatible with all software platforms and any major video format. It supports live HD analysis, recording and editing of videos with tags and diagrams, producing detailed performance breakdowns and game statistics. LongoMatch is powered by Fluendo’s ONEPLAY technology. Glasgow Girls FC Partner With Fluendo. Sports Techie, while you watch the remainder of the 2015 FIFA World Cup in Canada tonight with the US National Women’s Team plays against Columbia in a loser out match, know that video analytics plays a big part of pre-game, in-game and post-game coaching strategy for women and girls football teams which is what LongoMatch is in sports business worldwide for. LongoMatch works for pro, college and amateur sports programs, it will work for you. “I believe that the LongoMatch program itself is beneficial for me as it is relatively easy to use and also makes coding a game a little bit quicker than using other program in the market,” Gallagher added. Writing code, indexing clips while running analysis of individual players and breaking down opposing teams film or doing a self-scout of your own team, is all made simpler and quicker using LongoMatch. Its #gamechanging for the GGFC.